My husband cut about 3 inches off the shelves and moved the shelf support bars back, which enabled me to put some racks on the doors. 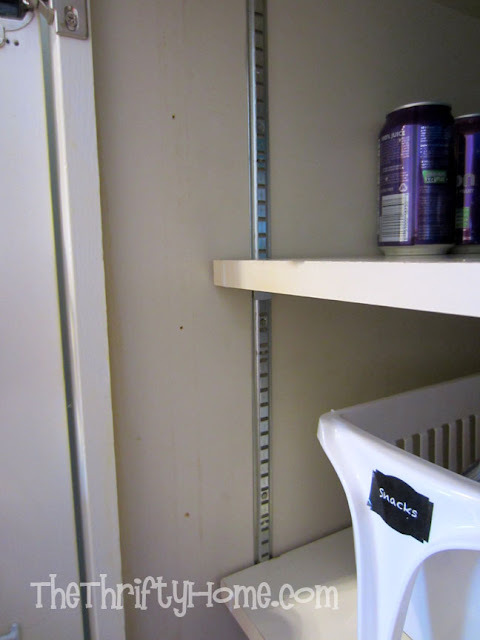 You can see in the photo below where we moved the shelves back. 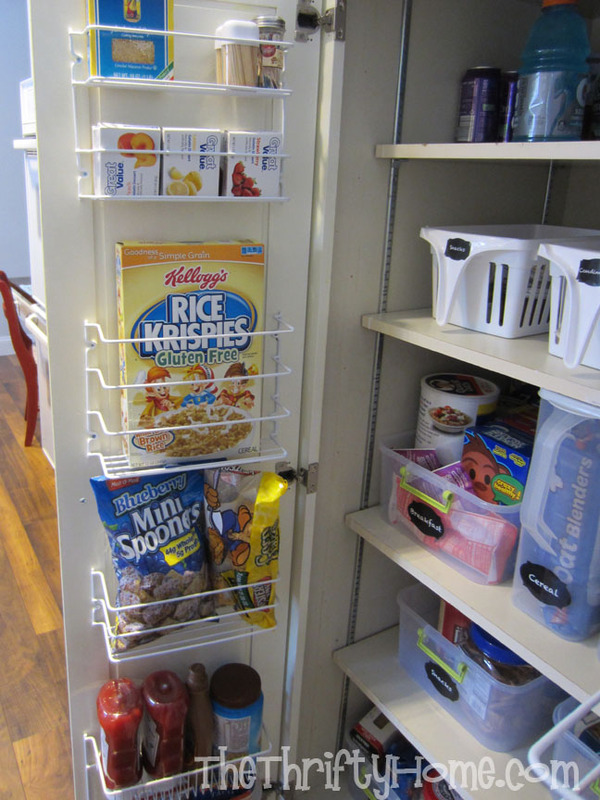 I bought 3 wall mounted cabinet rack sets from Wal-Mart for $7.44 each (each set came with 3 different racks). I bought an extra large lazy susan at Bed Bath and Beyond for $10 (after my $5 off coupon). 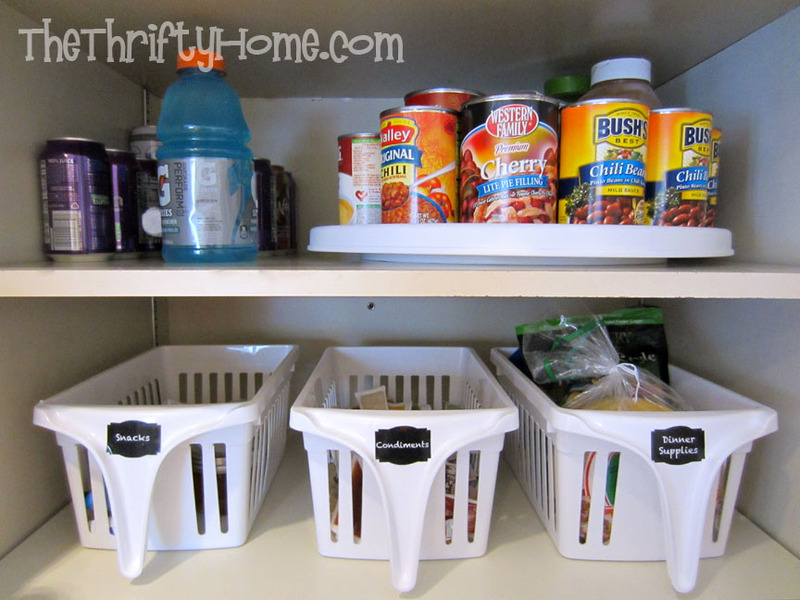 I bought the 3 baskets with handles at Wal-Mart for $2.50 each. 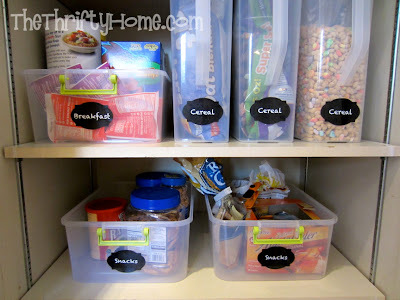 I bought the large cereal containers at Wal-Mart for $5.74 each and the totes were $4.47 each. I just printed mine on regular paper and ran them through my Xyron sticker maker. As I was sorting out everything, I discovered lots of duplicates. 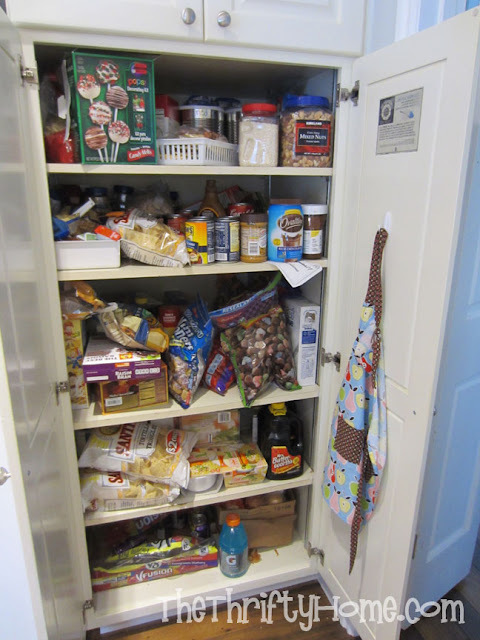 With such a deep pantry, it was hard to see what we had, so duplicates were bought and food in the back went bad. 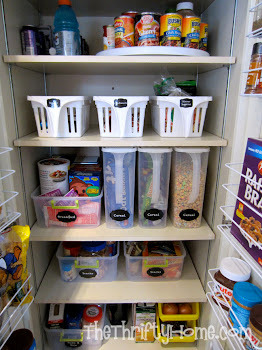 I spent a total of $57.07 on containers and racks, but will end up saving hundreds of dollars on food. 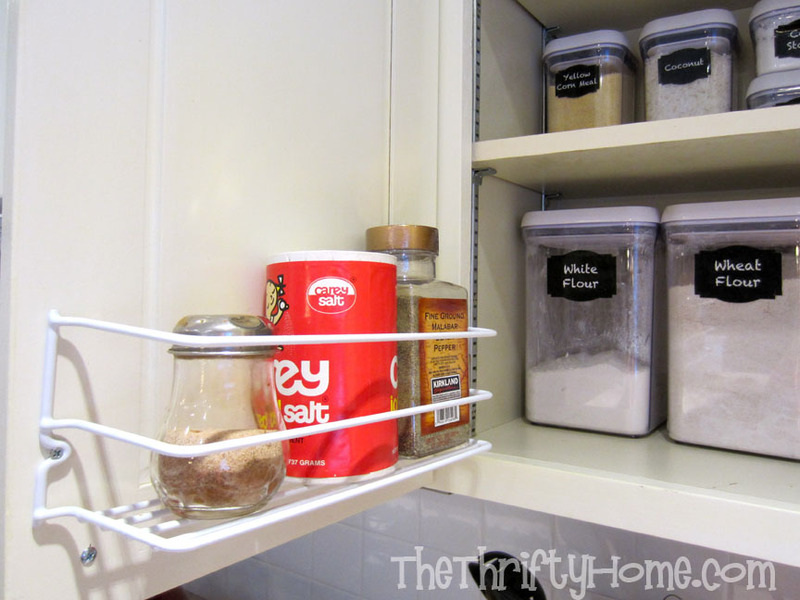 I had 2 racks left over, so I decided to give one of my kitchen cabinets a quick makeover. It wasn't too bad since I already had OXO containers that I bought and labeled about 4 years ago. 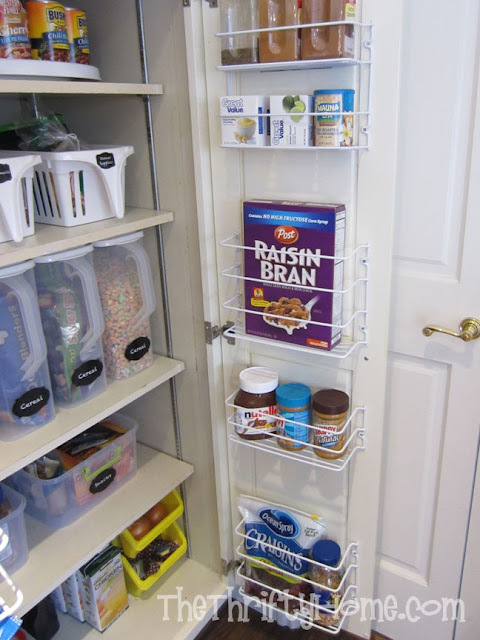 By putting racks on the cabinet doors, I didn't have to put stuff in front of my containers and could get it out of the way on the doors. 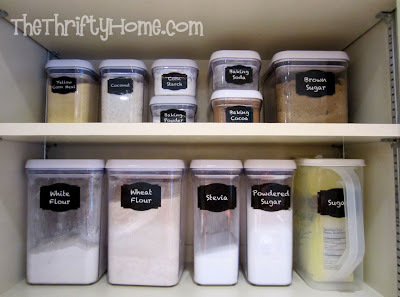 I also really liked my new chalk labels in the pantry, and decided to re-do the ones on my OXO containers. These are some extra spices that didn't fit into my spice rack that is hanging in the other cabinet. I had them sitting in a drawer, which I was able to empty out after hanging this rack. Now I have a completely empty drawer! It is amazing what a little cleaning and some fresh new labels will do. Once I start organizing, it is hard to stop. I was only going to do my pantry, but loved how great it looked and had to keep going. 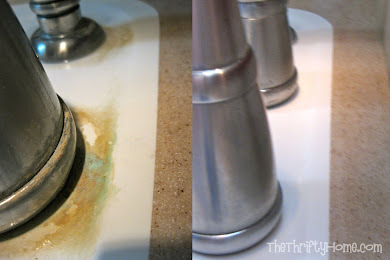 Even my husband who hates cleaning and organizing started to get into it when he saw what a difference it made. This looks so nice! 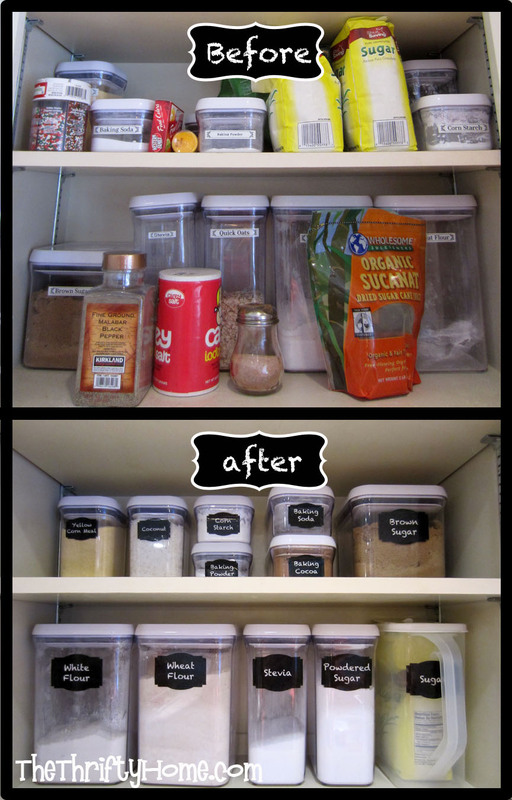 I reorganized my pantry over the summer and I must say it makes cooking easier! I also can open the door without being embarrassed. LOL!! Good Job, and the lazy susan is smart! How did you attach the wire baskets to the cabinet doors? Did you use very short screws, or something else? Looks great! Same question....how did you attach the wire racks without the screws going through the front? Good luck organizing your pantry, it is a lot of work, but worth it. I still get a smile whenever I open mine and see it all organized. I know this is a very old thread and I may not get a response, BUT, I am wondering how the rest of your kitchen is organized. 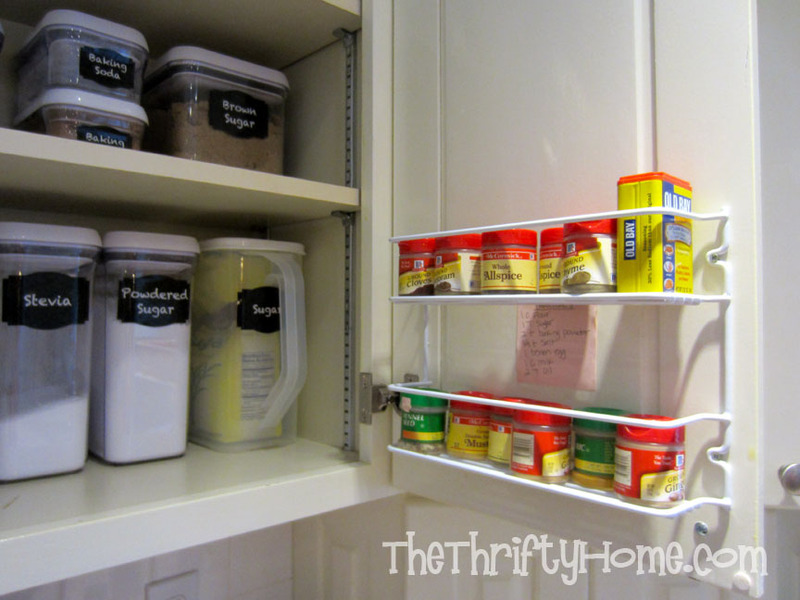 I have a small galley kitchen with one of these deep pantry units. 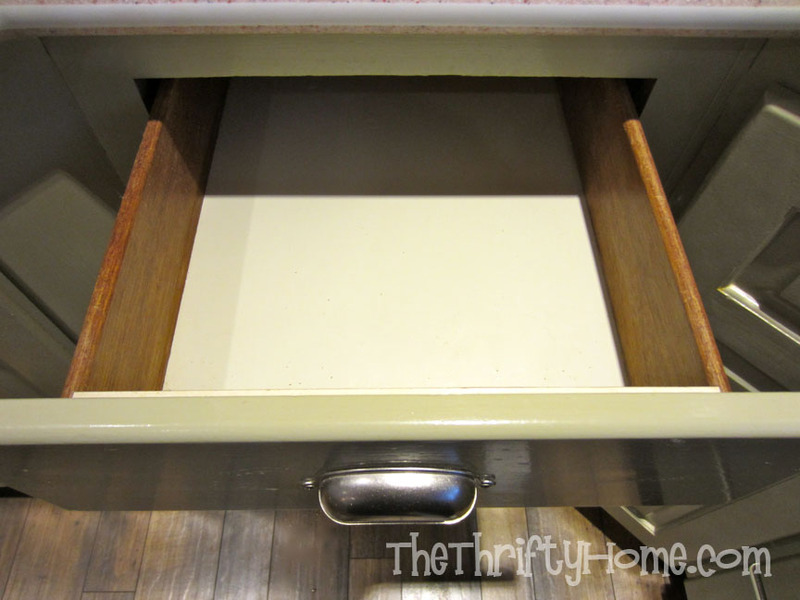 I also have next to this a 18" cabinet, stove then another 18" cabinet with same size upper cabinets above them. Across the way opposite the pantry is a smaller 15" 4 drawer unit and a 30" cabinet. With a 42" upper cabinet. next is the sink with the dishwasher and ref. Above the dishwasher is a 21" cabinet. My space is very limited in this kitchen and there are not other storage places in the kitchen. I am very good at organizing and have made the best of this situation but am becoming more and more irritated with the arrangement since my food is not all in the same area and things feel disconnected. Wondering, if you get this, what your suggestions would be as to how you would arrange the kitchen for optimum flow. I'm a very visual person, can you send me some photos? 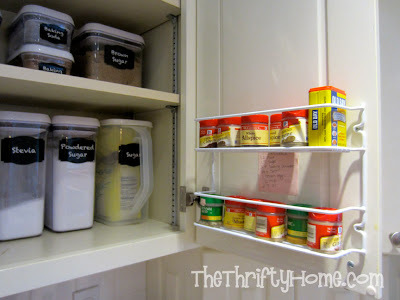 I love a good organizing challenge and am happy to post your photos and have others comment with solutions. 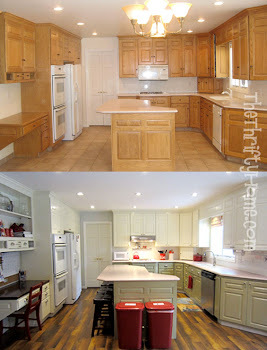 I emailed you photos of my kitchen as it is now. The kitchen has an over the stove micro that is broken and being replaced the end of the month along with all new appliances. So the 2nd microwave will be removed then. I just moved the micro and toaster oven to that cabinet as they were on either side of the stove previously. Not sure I like them there but trying new setups as I rework the kitchen.